For developers considering a premier destination, the new Aura development in Liverpool should be at the top of many investment shortlists. The days of dismal student accommodation is now just a distant memory, and the Aura complex provides a wonderful new way of living for students in one of the most vibrant and up and coming cities in the whole of the UK. Based within the Knowledge Quarter of Liverpool, this incredible development contains 1,007 luxurious student pods and apartments. With the University of Liverpool just four minutes’ walk from the site, it is likely to be a firm favourite with students and their parents. Unlike typical student accommodation, the Aura development puts a strong emphasis on luxury. It includes state-of-the-art amenities such as gyms, yoga rooms, bars and restaurants to make it the perfect home for any student. With Liverpool John Moores University, the University of Liverpool, the Royal Liverpool University Hospital and the Liverpool Hope University Creative Campus all on the doorstep of the development, there is a huge pool of potential students who would leap at the chance of occupying a unit within the Aura complex. The close proximity to Paddington Village, Liverpool Lime Street Station, the Liverpool Science Park and the Liverpool Institute for Performing Arts makes this an enviable location for anyone in this thriving city. The Knowledge Quarter is well known as being a dynamic area where education, science, health and technology meet. Further development is planned for the area to make it even more of a desirable place to live and spend time in. This fully managed complex has been designed to stand out from the neighbouring student developments, making something truly special for both investor and tenant. Investing in the Aura development is an opportunity that is not to be missed. Starting at £62,950 for a unit, any investor can expect to receive 8.5% net for five years. The development is due to be completed in the final quarter of 2019 and the investment will be through an established UK developer. To purchase a unit within the Aura development, a £5,000 reservation fee will need to be paid when the reservation form is completed. A quarter of the purchase price, less the reservation fee, will be due on the exchange of contracts, which takes place 28 days after the reservation is made. A further 25% will be due in March 2018, followed by the final 50% upon completion. A Student Pod within the Aura complex costs £62,950 and is 13.75 square metres, whilst a 25 square metre Studio will cost £77,950. The modern en-suite and self-contained studio apartments are arranged in clusters, making it a sociable but private experience for the student residents. By being part of the Aura development, an investor will be part of a new generation of student accommodation. The combination of luxury housing with a potential market in the tens of thousands, this is an opportunity that is not to be missed. 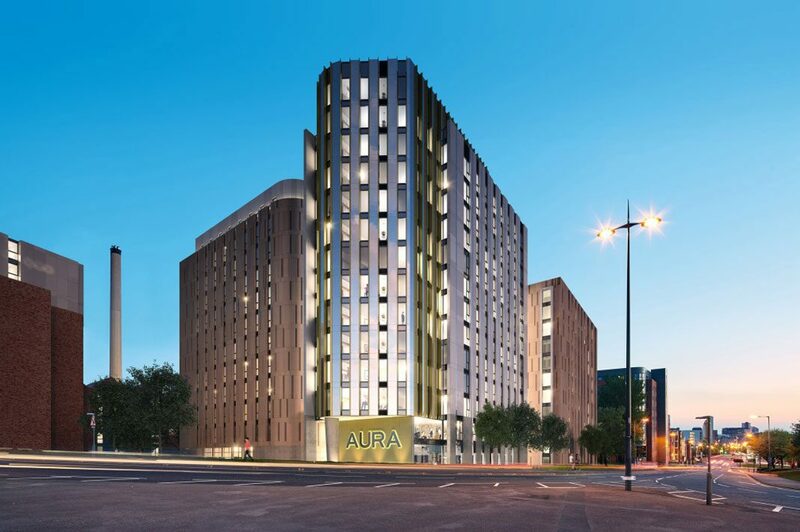 For more information on the Aura in Liverpool, please contact Hopwood House.